Wide, grand entrances are a popular trend in modern homes, but such broad openings at the front, side or back of your home can also be vulnerable to intruders. 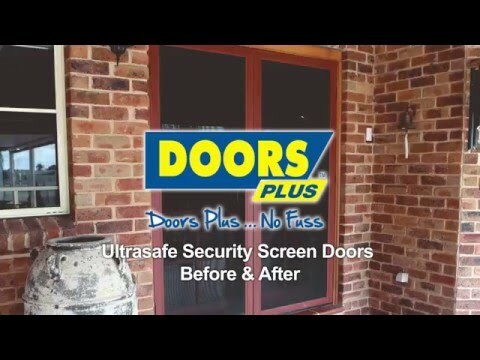 At Doors Plus, we have developed an exclusive range of UltraSafe security screen doors that are specifically designed for wide external entrances, offering superior protection for you and your family. The sturdy aluminium frame and remarkably strong stainless steel mesh have been carefully constructed to meet the highest Australian quality standards, and our screens have been subjected to rigorous testing for their resistance to impact, knives and jemmies. Your large security screen door is held firmly in place by three heavy duty hinges, with no visible screws. For doors that are wider than 920mm, a standard mid-rail is included, for added reinforcement. Our large security screen doors are custom made to fit your existing wide door, and can allow either single or double entry. We have also integrated a door close action, to prevent slamming as people come and go. Whether you’re home or out and about, your large, lockable UltraSafe security screen gives you complete peace of mind. Standard mid-rail for doors wider than 920mm. Reinforced for maximum strength. Made of an aluminium frame with a stainless steel mesh that meets Australian standards, these doors are subjected to an impact, jemmy and knife-shear test. Available in seven designer colours, our Ultra Safe Security Doors are custom made to fit a variety of applications. Whether you need a standard hinged, large entry, double entry, single entry or anything else, they can be completely customised to suit your home.